A must read for Fantasy Romance lovers. OMG! Finally an awesome fantasy romance. Radiance is one of those novels that makes you feel giddy with happiness. He almost leapt out of his skin when Ildiko stared at him as both of her eyes drifted slowly down and over until they seemed to meet together, separated only by the elegant bridge of her nose. “Lover of thorns and holy gods!” he yelped and clapped one hand across her eyes to shut out the sight. “Stop that,” he ordered. Thats another thing I liked about the book, its humor. I know I am repeating myself but I just loved Radiance. I hope the next book is good as this one. 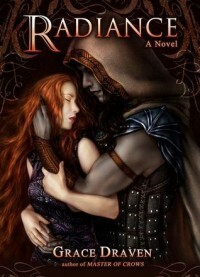 I rarely give 5 stars to a book but Radiance thoroughly deserves it. So a big thumbs up.